Emanuele Vittorioso was born in Siracusa in 1977. In 1998, he moved to Milan where he attended the Academy of Fine Arts of Brera, specializing in Restoration and Conservation of Cultural Heritage. Owing to his professional qualification and experience gained from painting workshops, he undertakes a number of restoration works, and never omits dedicating time and energy to his personal journey across colours and paints. 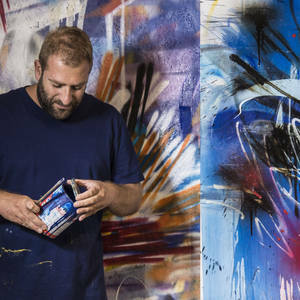 His in love with Street Art, which strongly emerges from his initial works: He prefers spray paint for their realisation, and borrows writers' techniques with a personal touch. He investigates artistic languages, and is in continuous and laborious search of pursuing his distinguishing style. Fascinated by 1950s and 1960s Italian painting, he has developed his personal stroke. His canvasses of matter and informal art express energy and movement through perfect chromatic matching and sudden colour explosions.